A man has been jailed for five years for class A drug offences following a hearing at Guildford Crown Court yesterday (Thursday 14th February). 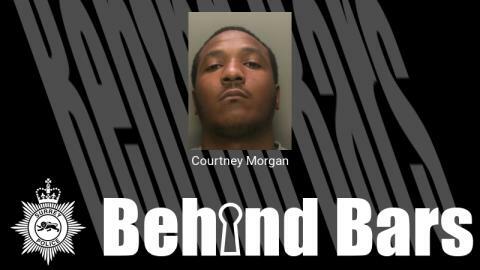 Courtney Morgan, 24, from Tulse Hill, Lambeth, was stopped by police on 12th September, 2018 on Headley Road, Leatherhead and a search uncovered class A drugs, cash and a phone. He was released under investigation but arrested again after he was stopped by officers on 21st November 2018 on London Road, Dorking. Suspected of being part of a county line dealing class A drugs in Surrey, a search of the car he was in uncovered cash, mobile phones and lubricant. He was remanded in custody as it was thought he might be concealing drugs internally. This proved correct when, under constant watch, £600 worth of crack cocaine and heroin was found in a specialist drug toilet. Morgan was charged with possession with intent to supply crack cocaine and heroin for the September offence and possession with intent to supply heroin for the November offence. Investigating Officer PC Elliott Hartley said: “This was a good result for us. The sentence was handed out after a lengthy investigation into Morgan’s actions and reflects the severity of the offending. Officers are proactively deterring criminals travelling from outside the county under Op Viking, which has been in operation since late 2016 to disrupt cross county border drug dealing and associated violence across east Surrey.